Many Israeli army jeeps invaded, on Wednesday morning, many areas surrounding Al-Quds University in Abu Dis town, southeast of occupied Jerusalem, and caused several Palestinians to suffer the effects of teargas inhalation. 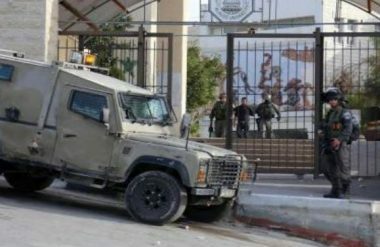 The soldiers surrounded and isolated Al-Quds University, and the nearby Schools Street, before preventing dozens of students from reaching their education facilities. Many Palestinians protested the invasion, and hurled stones at the army jeeps, while the soldiers fired concussion grenades, gas bombs and several rounds of live ammunition. Medical sources said many Palestinians suffered the effects of teargas inhalation, and received the needed treatment by local medics.